SKU: AL34. Categories: Collars, Leashes. The Alaskan features our two-inch limited slip design. 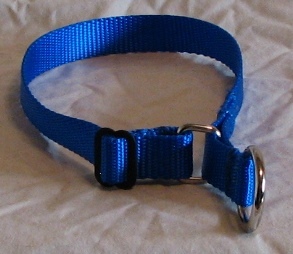 The collar normally lies loosely on the dog’s neck; when pulled, it tightens just enough to hold the dog securely. This collar minimizes coat wear around the neck. 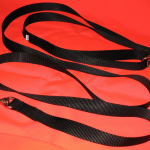 GENERAL COLLAR INFORMATION-Ours are the original adjustable collars designed for working dogs. They are the tough, humane, reliable, and inexpensive answer to kenneling, chaining, and working your dogs. The adjustment design uses the full strength of the web—no holes to rip out, no weak hardware or moving parts, no loose ends for puppies to chew. Once set, the adjustment locks into the web, and stays until reset. The rings are easy to hang onto, even with gloves. The hardware is solid, one piece or welded. These collars are stronger than leather or chain, easy on coats, and skin, more secure than collars requiring buckles, and largely unaffected by extreme weather and hard work. COLLARS WITH SIDE RELEASE SNAPS SHOULD NOT BE USED FOR TIE-OUT. For dogs who manage to loosen up the adjustment on their collars try the double slides. Sizes – Klondike, Alaskan – Custom sizes by request. Small collars come with a 3/4″ d-ring, larger collars come with a 1″ o-ring. 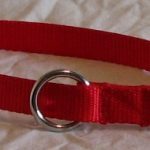 A 3/4″ d-ring MAY be requested on any size collar. Other sizes/type rings may be requested.